Sings To A Small Guitar (177/365 year 3) – Annoyingly Boring? 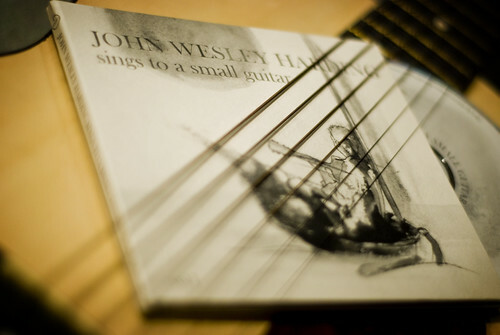 Not the first, and probably not the last time a John Wesley Harding release makes the project. Used one of the kids toy guitars to set the shot up. It’s ‘small guitar’ on a small guitar. Early impressions are good, very good. It’s an album of previously unreleased demos and such. Just Wes and a guitar. Just really solid. Hear a little, and learn more on Wes’ site. Love the DoF and composition. Will check out the music also.